Some months ago, I saw a highlighter pen-like gadget at an aesthetician's. I asked her about it and she said it would tell you how much moisture there was on the skin's top layers, and if the skin was oily, dry, or dehydrated. Hers was a professional model and I have no idea how much the thing costs or where it can be found (professionals' secret equipment stashes??) but I can tell you that a number of basic models are available on Amazon for prices as low as $10 and even $4.70, depending on the display. I picked up two a few months ago and have had great fun playing with them. 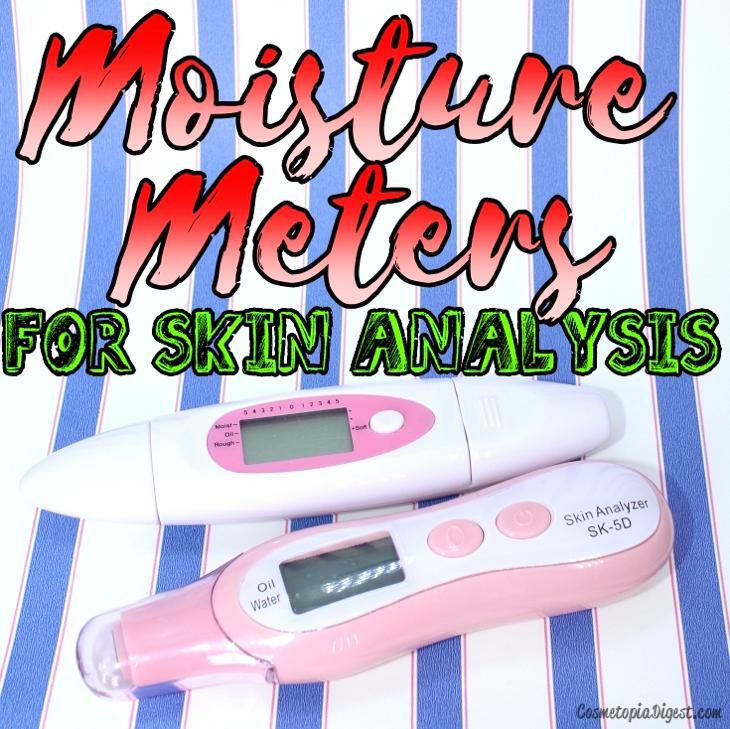 Scroll down for more on skin analysing moisture meters, and how they tell you if your skin is dry, dehydrated, balanced, or oily. Ever seen moisture meters for the soil? The ones with long probes that go a couple of inches into the ground, and give you a reading? Like this one here. My garden-loving Dad has a couple of those. The principle of the skin moisture meters is the same, but the probes, obviously, don't go in deep, because you don't want those sharp 4'' "nails" anywhere near your skin. The skin moisture meters have a more egronomic, compact design. These are battery-operated. The probes are flat and need to be pressed gently on the skin's surface. They measure approximately 5-6'' on an average, and come with an LCD display and backlight, to show the readings. Both the models I have show oil and water content. One shows proper figures while the other just shows a bar diagram. Needless to say, I prefer the first one. The first model (SK-5D) measures both oil and moisture from 0-99.9%. There is a power button and a reset button to clear readings. Once you switch on the power button, the display area blinks four times. After that, all you have to do is hold the probe perpendicular - gently - against the skin, to get the readings. The second model, as I said, only indicates the general level of moisture, oil and roughness, as a graph. I prefer the first one with specific percentages, of course. The aesthetician told me there should be a minimum of 30% moisture on the skin, and 50% means your skin is holding up nicely. Anything from topical acne medication to cleansers and makeup - even sun exposure - will obviously affect the moisture level readings. Once you apply moisturiser, you can see the difference in the readings. You can also test the readings after a few hours of moisturising, so you know if those 16-hour-hydration claims by certain creams are true. If the LCD is green, it indicates moisture balance. If it is red, it indicates severe dehydration. If it turns orange (never happened to me! ), it indicates saturation point. That happens to be my goal, because there is no such thing as over-hydrated skin. I think they are cool, and, at $10.46 and $4.79 respectively, you can play with these nicely. I've had them for a few months now and haven't had any problems with how they work. Buy here if you like the SK-5D, which is my favourite model. If you prefer buying from eBay, go here - price includes international shipping. Go here for the other model - it costs just $4.79. I mean, that's insane! While you have fun looking at - and buying - these gizmos, this week's top makeup posts are here. Not affiliate. Purchased. Nowt to disclose except that - on a totally unrelated subject - I'm going on my annual health check-up tomorrow. Wish me luck!